Entering a labyrinth is a way sort of coming home. Standing at the doorway to a labyrinth feels natural, deep and comfortable, and yet also an adventure. Though I’ve painted quite a few labyrinth paintings as a form of meditation, the most satisfying way to interact with a labyrinth is to walk it. So I’ve sought out labyrinths wherever I could find them, homing to sites as diverse as desert mesas, churches, cancer centers, and beach bluffs. That sense of returning, of going deep into who I am, is always there, no matter what materials it is made out of, or how it has been personalized by the makers. While I might have learned that its organic nature mirrors specific aspects of our bodies, its spiral pathway a macro version of our DNA, my attraction to labyrinths is instinctive. I encountered the basic labyrinth diagram in my studies of other mandalic forms. I had been working with more linear sacred geometric forms of various types for years, all spinning out from my first investigations of the Flower of Life. Fascinated by circle-based architecture, rock art and 2D art, I was simultaneously exploring how the human body and psyche interacted with geometry in ritual and ceremony. The labyrinth seems to have sprung from the earth, unlike the elegant linear mappings of the universe known to thousands of mystics and geometers. It feels feminine. After years of labyrinth experiences, I had the chance to build a full-size labyrinth, and I leapt at it. As part of a mandala seminar in JFK University’s Arts & Consciousness Program that I was teaching, my students and I created our own portable canvas labyrinth. The collaborative process of planning, designing, physically creating, and then walking the 18’ square mandala connected us in a way the seminar hadn’t touched. The intelligence of that ancient form guided us from the get-go, as we crawled all over it: achieving full body contact with it as we measured, taped, and painted. Afterwards, we used it not only for ourselves, but for events and workshops and seminars at the school, and afterwards I used it as a facilitator with other graduate programs, for in-services, and for retreats—a literal magic carpet that could be unrolled and beckoned into service at will. The earliest architectural labyrinth sites were created about 6000 yrs ago, and are situated in the arctic circle. The initial labyrinth diagram seems to have spread south across the earth from its first appearance in the north, filtering down into the Mediterranean, and from there, to other continents. 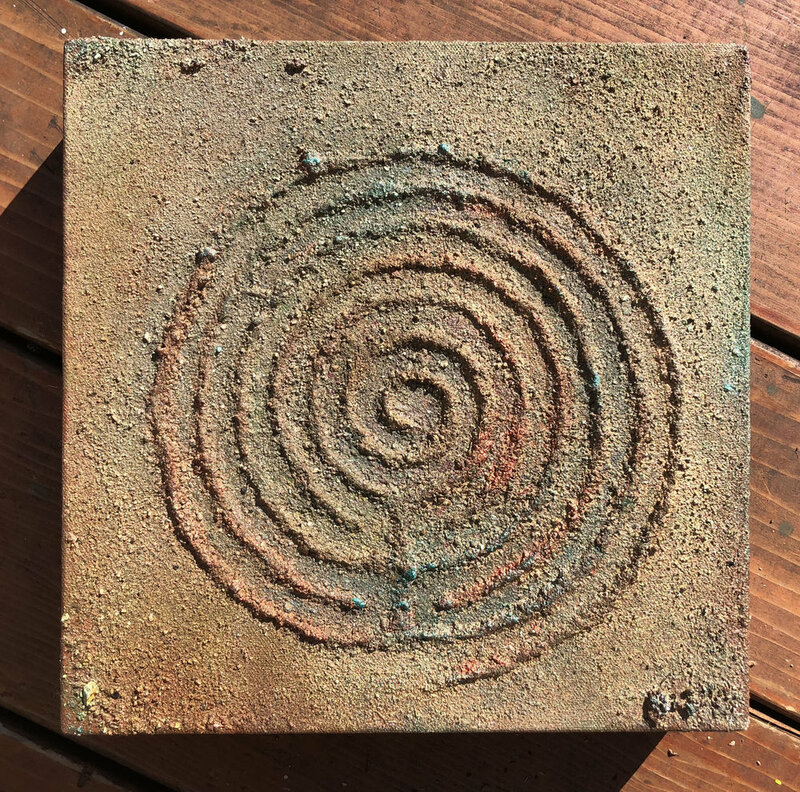 Vestiges of labyrinth art can be found world-wide: in myths, recorded on ancient coins, stamped onto cloth, woven into baskets, etched in rock, and built into the earth, but no vestiges or record of labyrinths have been found that pre-date the site above the arctic circle. As it has been honed and refined in the years since, adopted by designers from roman villas to cathedrals to public parks, it has continued to beckon to human seekers. One way into center, one way out. For me, The Flower of LIfe is a sort of coming home: I am coming to the place where I belong. When I am making a drawing or a painting of the Flower-of-Life, I feel in synch with life, like everything around me is exactly as it should be. Why paint, sing, write, dance, act? Try meditating with the Metratron's Cube that accompanies this post.